Donovan Mitchell’s whirlwind summer continued Wednesday night. The Utah Jazz shooting guard was awarded an ESPY as the best breakthrough athlete after a rookie season that saw him lead the Jazz to the second round of the playoffs. Mitchell finished second in Rookie Of the Year voting in his initial season out of Louisville. In addition to leading the Jazz in scoring, Mitchell turned in notable postseason performances, such as scoring 38 points in a deciding Game 6 win over the Oklahoma City Thunder in the first round. Beyond his performances on the court, Mitchell is proving to be charismatic off the floor with a voice on social issues. He won the NBA’s slam dunk competition, paying homage to legendary dunkers of the past such as Vince Carter. 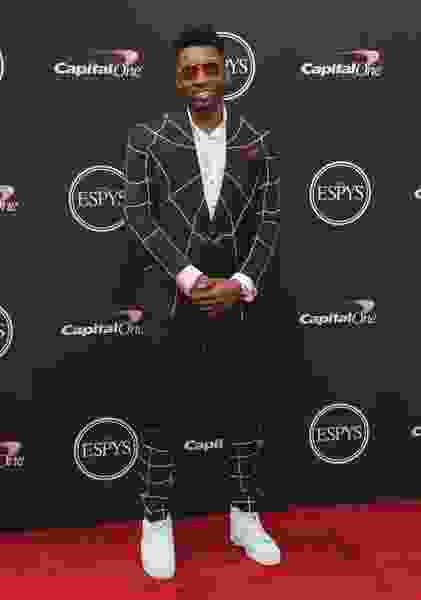 He showed up to the ESPY’s with a Spiderman themed suit, playing off his nickname “Spida”. On the Fourth of July, he went barbecue hopping, celebrating the holiday with Jazz fans. And in the wake of the Papa John’s scandal, Mitchell on Twitter suggested Louisville’s football stadium — which had been named after the pizza mogul — be renamed after Louisville legend Muhammad Ali. Mitchell has said he is dedicating much of the remainder of his offseason to workouts with the Jazz coaching staff. From a public forum, he’s become possibly the most visible Jazz player ever and has done so in the space of one year.